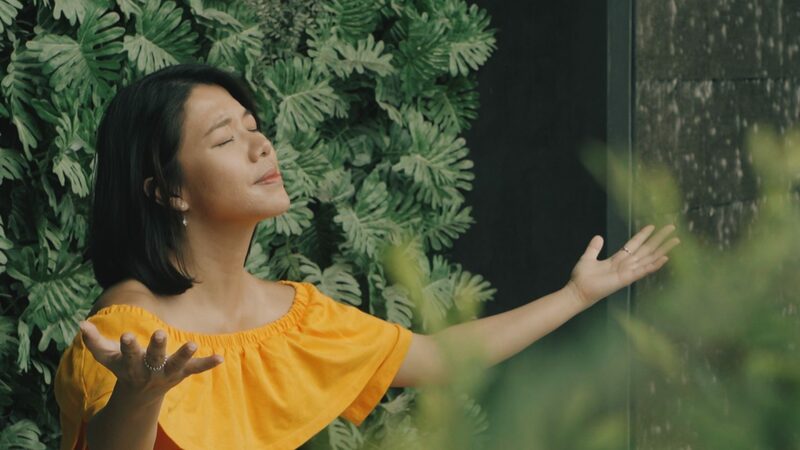 This National Day Week, Salt&Light brings you stories of extraordinary faith among Singaporeans both at home and abroad. 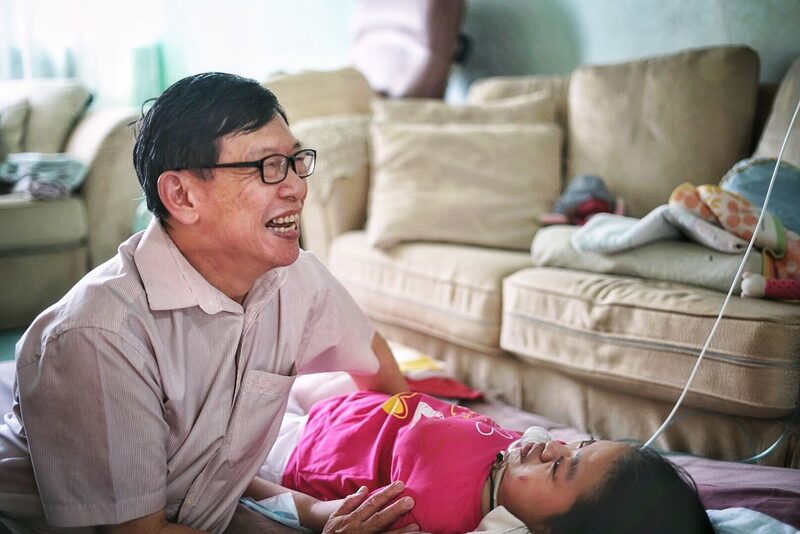 Singapore Bible College lecturer David Lang, 60, is the father of two children struck with a rare genetic disorder called Niemann-Pick Disease Type C. The disease causes the patient's physical and intellectual functions to deteriorate over time. Photo by Rachel Phua. David Lang is a surprisingly chatty man, despite the heartache that encircles him. As the tunes from a children’s television show hum in the background, Lang talks about the theology of suffering at the dining table. 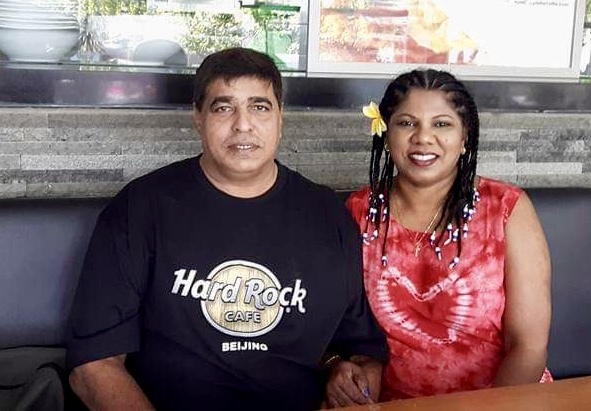 But first, he apologises profusely for forgetting about the interview, before he makes a spurt around his home, a spartan five-room flat along Farrer Road, to get ready. 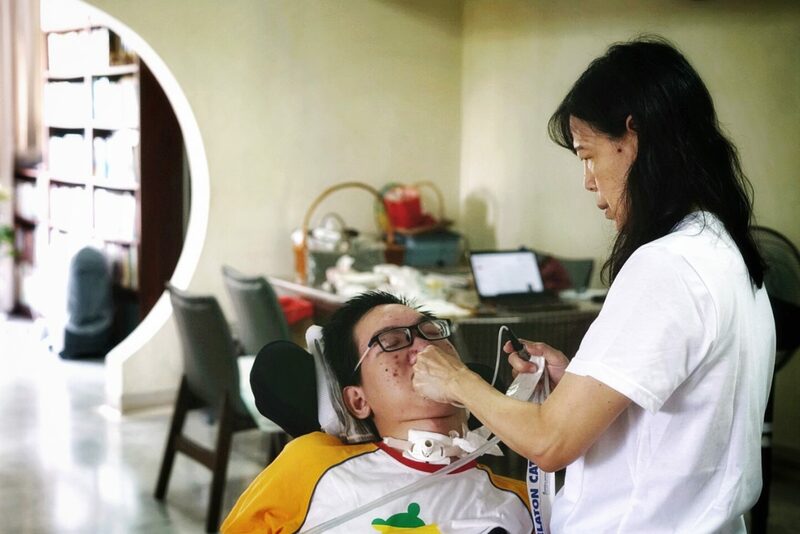 The 60-year-old, who won the Extraordinaire Caregiver Award this March, is a lecturer at the Singapore Bible College, his alma mater. Yet these days, academic pursuits have taken a backseat for the father of two (it used to be three). His two surviving children, Justina, 27, and Titus, 21, both have Niemann-Pick Disease Type C, a rare and fatal genetic disorder that has caused their intellectual and physical faculties to weaken. There is currently no cure for it, and there are only about 500 diagnosed cases worldwide. Lang believes his children are the first known cases in Singapore. Though born healthy, they are now paralysed and and unable to speak. Both of them are bedridden, tube-fed, and require a ventilator to breathe. As the older child, Justina is almost fully paralysed, to the point where she is unable to move her head or control her eye movements. Lang and his wife take their children out for walks around their block every evening. 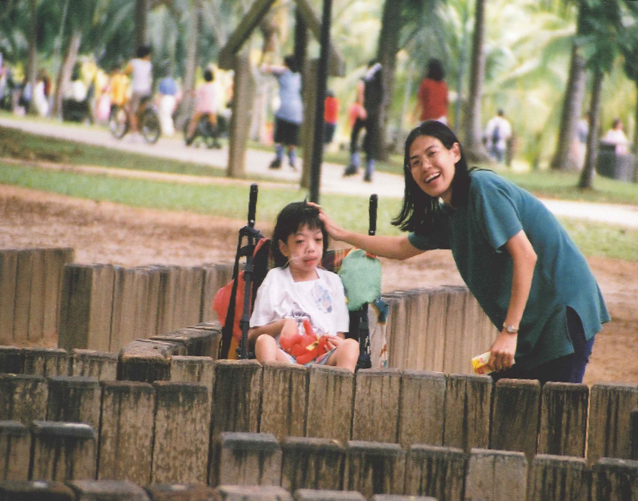 On weekends and public holidays, the couple take their children out to local attractions like Gardens by the Bay and Chinatown. Photo courtesy of David Lang. To look after them, Lang made special arrangements with the college so that he does not have to observe office hours. His wife, Loo Geok, 59, teaches Hebrew occasionally at the school while she takes care of the children full-time, alongside their two helpers. Justina and Titus require round-the-clock care, even when they are asleep – Lang and Loo Geok get up every three hours to clear their kids’ secretions. Naturally, Lang dug deep into Scripture at the beginning of his ordeal. When he and his wife identified their children’s condition, it was more than six years after Justina first showed symptoms of the disease. By the time she was 13, Justina had been transferred from doctor to doctor, misdiagnosed with cerebral palsy at one point and put on a variety of drugs to control her seizures. The death of Lang’s second child, Timothy, was what led to the discovery. It was June 2004. By then, Timothy was already displaying early signs of Niemann-Pick, acting up uncontrollably and having difficulty swallowing. One morning at breakfast during church camp in Johor, he choked on a piece of bacon before it could be cut up. A church member who was a doctor tried to perform a Heimlich manoeuvre, but Timothy went into a seizure, making it impossible. He was turning blue as his family rushed him to the local hospital. After 19 days in coma, Timothy died on July 19 2004, a month before his 11th birthday. 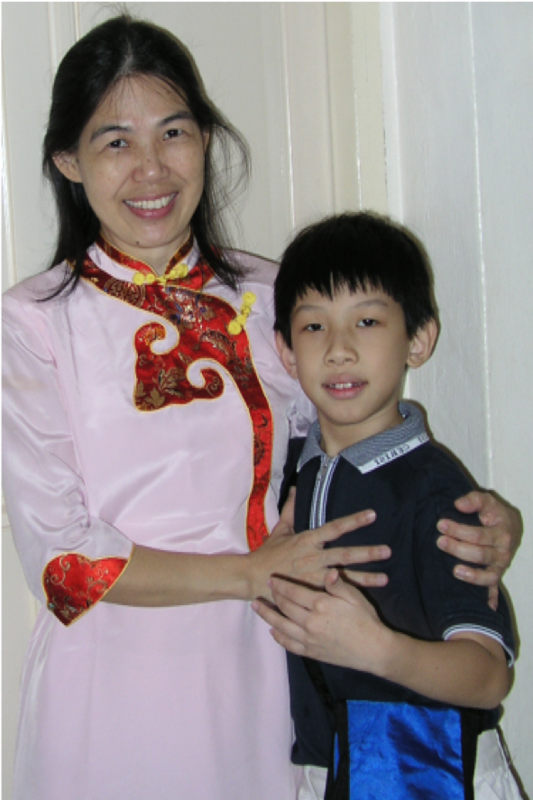 Timothy with his mum. Photo courtesy of David Lang. Lang recalls Timothy’s childhood. His son was a “brilliant” and “almost perfect” boy, he says. His family now jokes that Timothy was sanctified ahead of everyone else, which was why God took him home first. Timothy was a keen learner who loved to read and try new things. 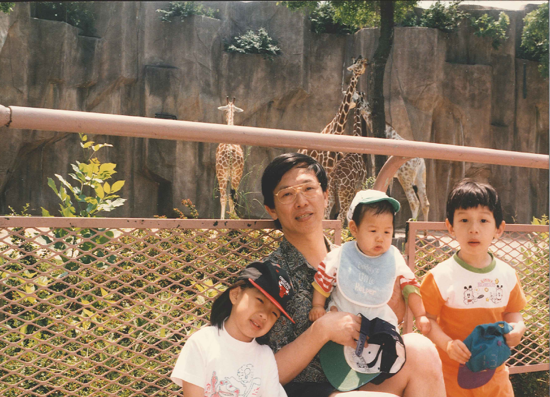 Lang brought his family to science museums frequently while living in the US, and Timothy would read all the information on the panels though his dad thought they were too complex for his age. He was never shy to introduce himself to other children either, or display his affections. “One of the things Timothy liked to do in primary school was to take the money we gave him for recess to buy something for me,” Lang reminisces. “He would buy a marker saying, ‘Daddy, I give this to you’. “I’d tell him, ‘This is money for you to eat at school’. But the next time he would present me with a sharpener or an eraser. Titus (left) and Timothy (right). Lang says Titus was badly affected by his elder brother’s death, and he became very quiet after Timothy’s death. Photo courtesy of David Lang. Meanwhile, Justina’s ailment was still a mystery among the doctors the family met, until her neurologist sent Timothy’s tissue samples to a research laboratory in the US that focused on rare diseases among adolescence. Subsequent tests showed that all three of Lang’s kids were afflicted. 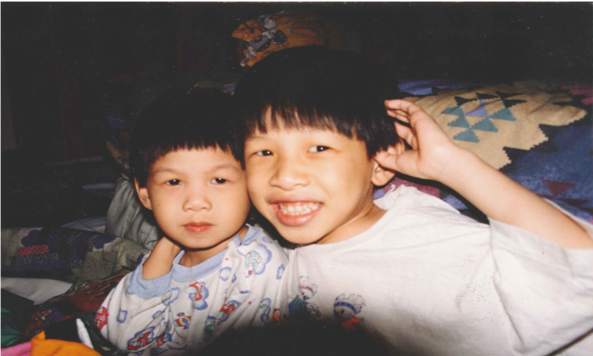 Lang says he and Loo Geok went through different stages of grief throughout the entire process – denial, anger, bargaining, depression, eventually acceptance. Like Job, Lang cried out to God: “Why me?” (Job 7:20) during the initial years. He was angry with God. Why would a loving Father allow innocent children to suffer? There was pressure on the couple to find the right treatment for their children: Put them on experimental therapy? Go for healing rallies? The pair often quarrelled with each other at the beginning, going to bed in tears, Lang says. Like Job’s friends, some of the couple’s acquaintances, while well meaning, added to their burden. Lang with his children during their early days. Photo courtesy of David Lang. To cope, Lang dove into the book of Job, which brought immense comfort at times when he felt guilty for his outrage towards God. “As a bible college lecturer, who am I to question God. Was I a hypocrite? I even thought of resigning,” he says. Lang saw the beauty of God’s sovereignty as well, in Job 38-39, when God finally answered Job through a long spiel of rhetorical questions. Some interpret it as God’s rebuke of Job, but Lang found compassion and grace in God’s words. He is in control over all existence. And like the carefree ostrich (Job 39:13-18) and the wilful horse (Job 39:19-25), God was going to give the Lang family the joy and courage to trudge on amidst the pain. But now my eye sees You (Job 42:5 NKJV). Because of his suffering, Job felt the very presence of the God he yearned for. Because of his suffering, Job felt the very presence of God he yearned for (Job 23:3). Lang was never this close to the Redeemer until his children arrived. “Actually, it was through Timothy’s death that I found peace with our children’s condition. When Timothy was in a coma, there was a strange sense of peace within me that I can only attribute to God,” he says, referencing Philippians 4:7. Lang could finally shift his focus from this earthly life to the eternal hope he had. Doctors were unable to detect Justina’s condition until she was about 13, more than six years after symptoms started appearing. Photo courtesy of David Lang. At Timothy’s funeral, Lang received a vision. In it, he and his family were caught in a fire, but a group of people was shielding them from the flames so they did not have to bear the full blast of the fire. He saw that his life was a gift from God, and the ability to undergo suffering was a community effort. Money is tight in their household. Lang takes home less than $5,000 a month, though monthly expenses hover between $7,000 to $9,000. They get by with help from their extended family, church members, strangers and the occasional crowdfunding campaign. A recent The Sunday Times article rallied his friends to help Lang raise more than $120,000 to replace one of his cars, a 28-year-old Toyota Corolla. Others have come up to them during their walks to offer words of encouragement, which he does not take for granted. These encounters have sometimes turned into opportunities to share about Christ, Lang adds. People would ask how he and Loo Geok cope, allowing them to slip into conversations the Gospel message. Lang chuckles. “We’ll probably outlive them,” he answers matter of factly. He has learnt to count his blessing. God has prolonged the life of both his daughter and his son, he says. Most people with the disease die between the ages of 10 and 25. 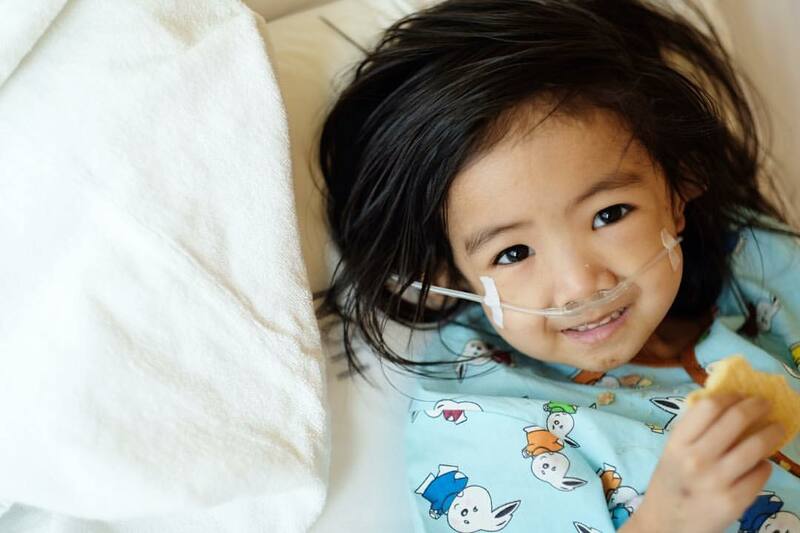 When Justina first needed a tracheostomy, a surgical procedure to create access for a breathing tube, one of the doctors Lang and his wife consulted was hesitant about the operation. While it would extend her life, it would also prolong her misery, the doctor told them. Lang’s wife, Loo Geok, 59, is the children’s full-time caretaker. Photo by Rachel Phua. The couple left the hospital undecided. Meanwhile, they continued to pump air manually into her nose using a resuscitator. 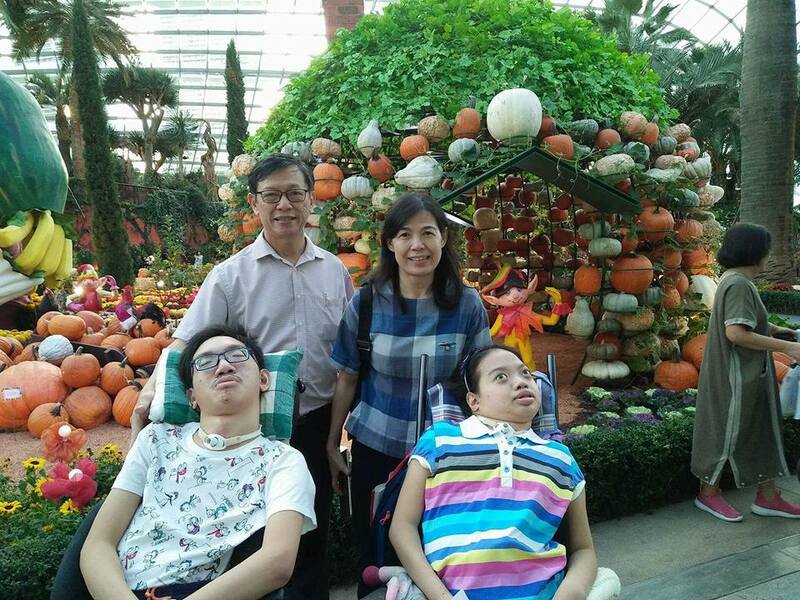 During the weekends, Lang and Loo Geok take their kids out to local attractions such as Gardens by the Bay and the Singapore Botanic Gardens to give them something to look forward to. “At this age, they still go out with their parents. Which child still does that at their age,” Lang jokes. Despite the optimism, Lang knows his children’s final days are approaching, especially Justina’s. Her condition has worsened significantly over the past two to three years, he says. Lang is bracing himself. One thing he has learnt is not to hold on to his children too tightly, but to see them as God’s treasure entrusted to them for the time being. “Let me enjoy them while I can. I’ll leave it to God when He finds it fit to take them home. Rachel Phua is a former reporter at Channel NewsAsia. Her stories have also been carried by several US publications, including the Dallas Morning News, the Austin American-Statesman, and the Austin Business Journal. Rachel is now a Writer at Salt&Light.